The big question on the tip of everyone’s tongue is: Does this Brown Sugar Black Chocolate Coconut Cream Bronzer work? Well, if you want to get a darkened looking complexion then it sure does! And I can tell you why. This tanning cream contains bronzers that enhance your tan to make your skin appear darker. This type of bronzer doesn’t use DHA. Instead, it is a tanning accelerator that reacts with the skin to increase the body’s melanin production. This changes the pigment of your skin to deepen its shade. So whether you decide to take it to the tanning bed or out under the sun, it will get you tanned regardless. If you opt to try this tanning lotion outside, don’t expect to get tanned as quickly as the tanning bed would get you. The results vary and you will ultimately need more sun time. There is no SPF in this Brown Sugar Black Chocolate Bronzer so you should definitely add some before heading to the outdoors. I wouldn’t say I tan easily but I do manage to get some color on occasion from using various tanning products, yet the Brown Sugar Black Chocolate Coconut Cream Bronzer gives me a tan every time. I don’t particularly like the skin shade this bronzer gives me, as I have had experience with other tanning lotions giving me a natural sun-kissed glow. This one just gives me a dark hue and the more I use it I just keep getting darker and darker. So if that’s your thing, then this is the bronzer for you. This is a lightweight dark tinted lotion that goes on pretty smoothly. It makes my skin feel very soft, silky and conditioned. I am sure this is mostly due to the coconut and argan extracts as well as the silicones that are listed as prime ingredients on the bottle. The coconut properties are especially good for your skin because it is a natural antibacterial and antifungal agent. Plus it is an excellent moisturizer that penetrates deep into your skin. This is great for treating dry and itchy symptoms as well as repair elasticity and suppleness. The silicone additive not only helps color pigments adhere to your skin but also contributes to water resistivity. If you love the smell of coconuts then you can also expect to get a good dose of it when you use this coconut cream bronzer. I’m not a fan of the smell of coconuts on this level; if it were mixed with other tropical fragrances then I would have a better appreciation for it. On the other hand, you will find that after you get out of the tanning bed you don’t smell like a burnt cotton candy. The science behind its make-up conserves the fragrance through the tanning process, leaving you smelling almost of fresh coconuts after. 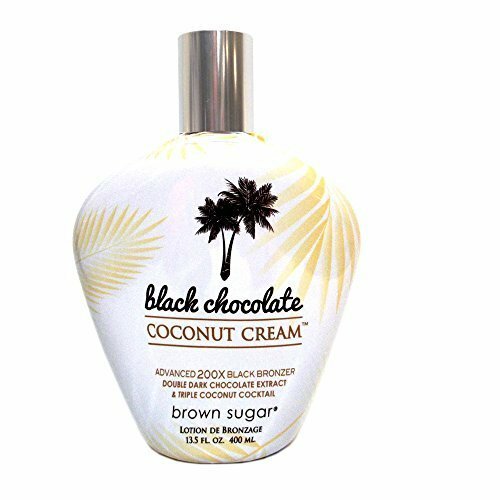 The Brown Sugar Black Chocolate Coconut Cream Bronzer comes in a pretty snazzy bottle. I love the shape and feel of the bottle; it is oval shaped with narrow sides, which makes it easy to hold and apply the lotion. 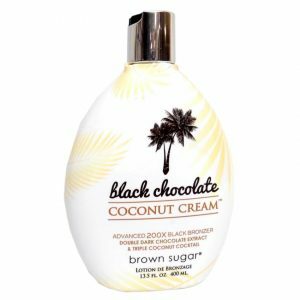 There is yellow palm tree leaves decorated around the bottle and two dark colored kissing ones at the top of the Black Chocolate Coconut Cream name. There is a slight downfall with its design. The overall color of the bottle is white and the lotion is of a brownish tint. When applying and reapplying the lotion, as you can imagine, the bottle gets pretty messy. It wipes off easily nevertheless and so does your hands, just do so as soon as you’re done applying the lotion. Knowing how to apply this and other tanning lotions are the key to the outcome of your tan. You will experience streaking and uneven shading if it’s not rubbed in properly. You will have to get your hands a little dirty to get the job done right. Once you are done tanning, there is an excess that will wash off during a shower, so taking a shower after is best advised and also before changing into your clothes. In particularly light color clothing. I also don’t recommend its use for achieving a base tan; accelerators works best to improve existing tans. Especially if you are very paled skin. This is just my personal systematic approach to getting just the right color. If this product is used correctly you will get the best results and value for your money. For personal reasons, that being the overpowering smell of coconuts and the distinct color it gives my skin, I would give it a score of around 3.5 out of 5 It would have lost another point for not having SPF guard, but to be fair it really was made for indoor tanning. Overall this Brown Sugar Black Chocolate Coconut Cream Bronzer is worth a try and I recommend without any reservation.